The International Association of Registered Financial Consultants (IARFC) is currently offering a discount for those who wish to apply and take the exam for the Master Registered Financial Consultant (MRFC) designation. For a limited time, the exam fee is discounted to $150 – a 50% reduction of the regular $300 price (excludes application fee). Sitting for the exam now benefits both the candidate and the Association. The consultant gets the reduction in exam fees and we enhance our supporting exam data for our accreditation application... Chairman H. Stephen Bailey, MRFC. The candidate must first meet the requirements in the areas of experience, education, licensing, conduct and ethics. After the application process is approved, exam times are scheduled with the testing company. The exam follows a set of guidelines put forth in the MRFC Blueprint Exam Content – based on survey answers describing the role and responsibilities of the practicing financial consultant. The format is a multiple choice, computer based exam administered under proctored testing conditions at approved testing centers. It consists of 125 four-part multiple choice items and has a three hour time limit. Candidates who receive a passing score on the exam earn the right to publicize and brand this prestigious designation. While the MRFC designation may be displayed it is still going through the application process with the NCCA for full accreditation status. Sitting for the exam and obtaining the MRFC designation is meaningful recognition to all aspects of the financial consultant’s career. To the Public – the MRFC is a Financial Professional who will uphold high standards when dealing with their financial affairs. To the Industry – the MRFC is a Financial Peer who has met strict criteria based on a set of standards and held accountable by the IARFC. To the Individual Consultant – the MRFC is an ethical, financial professional who participated in continuing education and works toward the financial freedom of clients. 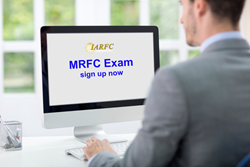 To apply for the MRFC exam, download the application and send it into the IARFC. Complete information can be viewed by going to the MRFC website http://www.pathtomrfc.org.